As nice as it would be for us to keep the same car all our lives, money-wise that is, all cars run their course and the need for a new vehicle inevitably comes. For most people, however, a car isn’t exactly a purchase to be made on a whim. Usually, you have two choices in the matter. Either you save up a significant amount, or you resort to monthly payments. However, a monthly payment can take up a large portion of your finances and monthly budget. This is why saving up for your next car beforehand and putting down a large deposit can alleviate major financial stress. Saving up for your next car is more than just putting a little away each month though. If you really want to save up for your next car, consider these five steps to do so. The first step to saving for your car is figuring out what car you want to buy and what you’re going to put down or pay in full. Do your research, shop around, and decide what you want and what you can afford to buy. Keep in mind that if it’s used you may also want to calculate into your costs any maintenance you could occur. Moreover, when choosing your car, it’s important to remember that higher-end cars cost more in terms of upkeep in the long-run as well. A great place to start when trying to figure out your car cost is by using an auto loan calculator or similar tool to accommodate sales tax, trade-in value, and possibly car loan terms. This can help you more easily figure out your ideal spending amount. Once you’ve decided how much you need to save, your timeline for saving is your next key step. Figure out when you want or, depending on your car’s longevity, how long you can afford to wait for a new car. 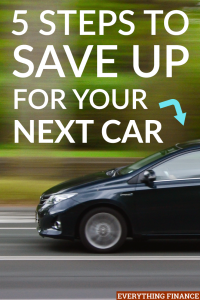 The sooner you want or need your car, the sooner you need to save. That being said, you can’t be unrealistic in your savings plan. For example, if your net income every month is $3,000 and your down payment is $5,000, you’re obviously not going to be able to save up in a week or two. Calculate into your budget how much you can save up every month after all your necessary expenses. If you’re in a situation where you need your car sooner rather than later, it may mean altering your expectations of the car you’d like with what you can afford. The key to your timeline is saving up a significant amount in a reasonable period of time without being impatient or unreasonable. One of the hardest parts of saving up for any major expense is not spending the money before you’ve reached your goal. If you don’t put your money away into a separate account, it’s all too tempting to dip into it in times of need. To prevent yourself from setbacks and prolonging the process, it might be wise to put the money away into an account you can’t reach easily; it could be the key to reaching your goal when you want and need. Another difficulty many face when saving up is actually sticking to their plan. Instant gratification is all too tempting. We see items in the moment and are tempted more times than not to make a purchase even if it means setting ourselves back and spending what we don’t necessarily have. Unfortunately, this is often the case when we manually take money out and usually costs us our savings goal. If your car is something you need sooner than later, it may be a good idea to simply make your savings plan mandatory. Instead of putting the money in a savings count yourself, consider making the process automatic. If your paycheck is already directly deposited into your account, have your accounting or payroll send a certain chunk of your paycheck directly to savings as well. By not seeing the money in your account initially, you’ll never know what you missed out on or what you could have spent. You won’t be tempted because there’ll be nothing there to tempt you. Your monthly budget likely has an array of categories already. You likely have all your necessary expenses, like rent, utilities, food, and gas, calculated in. Plus your normal savings, emergency fund, and maybe an entertainment fund as well. Adding another category to all that can seem a tad overwhelming. If that’s the case, a great option to consider is eliminating various luxuries or entertainment expenses from your budget for a short-period of time. Items like your daily latte, nights out, twice-weekly take-out, or HBO subscription, may not seem like they impact much, but can add up in the long-run. By cutting some of these things from your budget, you may find that you don’t have all that much left to save up to reach your monthly savings goal. That being said, however, be sure to leave at least one luxury or indulgence in your budget. If you deprive yourself too much, saving up will be made that much harder and possibly cause you to stray from the plan. Saving up for a car can seem like a long, tedious process. Many of us have a hard time putting away money for the future that we could be spending now. And while those items we see in the moment might seem worth it, there’s no doubt you’ll be happier in the end when you have a new, well-running car instead. Figure out what you can afford, create your timeline, and simply stick to your plan. By utilizing a few small tactics, you’ll be driving off the lot in a new car in no time. Have you purchased a new car recently? What were some of the steps you used to save up for your next car?